Andrew Zornoza, Where I Stay, Tarpaulin Sky, 2009. "In the process of constantly disappearing, the unhinged, unmoored and unnamed narrator of Where I Stay travels through a cracked North America, stalked by his own future self and the whispers of a distant love. From Arco, Idaho to Mexico City, he flees along the highways and dirt roads of a landscape filled with characters in transition: squatters, survivalists, prostitutes, drug runners, skinheads, border guards and con-men. Where I Stay is a meditation on desperation, identity, geography, memory, and love—a story about endurance, about the empty spaces in ourselves, about the new possibilities we find only after we have lost everything." Two roads meet like a cross upon the earth and there stops a middle aged man and his father and their truck. A dog squirms between them, its tongue dropping pearls of spit upon the upholstery. the younger man gets out, jerks his thumb to the bed of the truck where a sofa is lashed to the floor with heavy chains. The chains are spray-painted gold. The old man runs his liver-spotted hands through the dog's thick black fur, his eyes not leaving the windshield. You'll be king, he says. Alright, I answer. The younger man lowers the bed door, tests the chains. He's right, he says, you'll be king for now. King of the road. I went to the only friend I had. His parents were Mormon. With his family and other families we drove across the country in a caravan of mini-vans. We camped near the Teton Mountains. There was a three-legged race. I won a medal, printed on the tin, "favorite stranger: favorite new family member." Next year I got another medal, "Best loved hitch-hiker." One of the men worked in vice for the Salt Lake City police. At night he drank beer and I smoked cigarettes and his daughter plucked away at a plastic guitar while she sat on a log away from the fire. More often than not, Zornoza leaves it to the reader to place these disparate pieces into mental order, to fit them into some understandable arrangement of narrative and photo and caption. The headings on the left, with their dates marching from August to November provide a linearity to the slim paragraphs below them, but this seeming five-month journey is contradicted by paragraphs like the one above, with their claims of a journey lasting not months but years. Without more full-bodied clues as to how the book should be experienced, each reader will invent their own system: Like me, you may find the captions making unbalancing claims to fact from their proximity to the photographs, which make their own claims to truth even in this age of digital manipulation and computer graphics. And so what? Are we faced with a fictional novel on one side, and a factual photo-narrative on the other? Or are there two novels here, one made purely of text, and one of photographs and captions? Or has it been one novel all along, but one in which the narrator is less than reliable, is int the end as fractured as the America he's traveling? Even if it is a blend of fact and fiction, does that impact the truth contained in the book? Does the presence of the factual increase the truth content of the fiction, or does it detract? Are these the right questions to ask? Are any of these questions even close? I'm not sure that Zornoza has put the answers to these questions in the book for us to find. Or rather, I think that it's more likely possible that he's erased the answers, has lost them for us in the same way that this narrator seems to be trying to lose himself. "There are places I keep returning to," he says, in one of the captions from the middle of the book. Later still, the narrator sees a map taped to a wall, one where "lines have been drawn from spots on the map to the margins, each line ending in a crowded scrawl of letters and numbers, coordinates and temperatures, illegible words." The narrator says, "I wonder how long he has been out there." The narrator says, "I don't know." He says: "It all gets jumbled together." He says: "It's all about to be swept away again." He says: "[The] little home that I had had moved along without me." He says: "There was nowhere to go, as long as I was myself." The book closes. The left side—the fiction, the invented narrative beneath the forward march of dates—it folds into the right side, into the photographs and their captured truths, into the captions that illuminate or obfuscate that truth so that it matches or else denies the fiction that faces it. "The ‘road novel’ might be one of the most maligned forms in storytelling, in that for a mold that by in proper handling could be kinetic, shapeshifting, and packed with an uncontainable kind of light found only in certain kinds of travel, too many books get caught up in minutiae and joking, leaving out the language and the true moving meat. 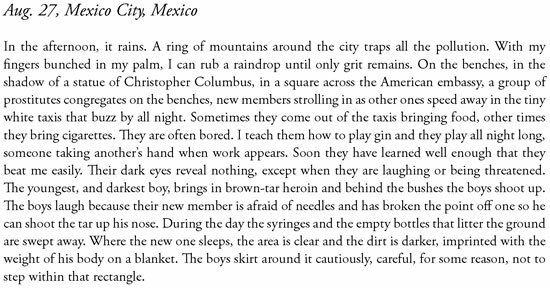 While each graph and location could be self contained for Zornoza’s striking lines, meditative and rhythmic in the mind of Mary Robison mashed with William Vollmann, the prose in sequence forms a narrative of seeking, of looking for something familiar in so much splay. The unbounded point-to-point of the narrator’s surroundings, in which he works strange crap jobs, meets roadside strangers, deals with his life, contains no abject want for summation, and yet therein reaches beyond the narrative in beautifully and concretely rendered fragments evicts a true sense of drift, though within the drift, the body. "Andrew Zornoza's marvelous first book is hard to pin down. 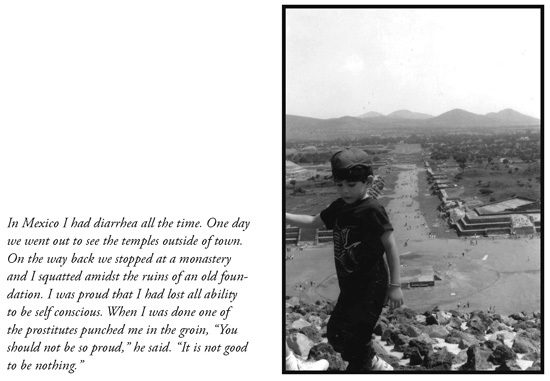 With dated and place-notated prose on one page and a captioned photo on the facing one, it seamlessly shifts its delivery from straight-ahead to a possibly unreliable photographer with captions that either expand on the text, or further question the reality and relationship between prose and picture. In action that takes place between August 2nd and November 25th, the unnamed narrator wanders throughout the American Southwest and Mexico. Perhaps action is too strong a word, as everything seems to come across as notes written on unsent postcards. Even the dedication, "To all those I've lied to," says something about the veracity of everything that follows. Here, in the middle of nothing, is a rusted bronze plaque: Incinerated Forest (Tree Molds). Taped to the plaque is a purple flower and a piece of paper. I pick up the paper and put the tape and flower in my pocket. A boy with a crown sitting on a rock orbiting the earth is drawn on the paper. Written underneath the drawing are the words, "What makes a desert beautiful, says the little prince, is that somewhere it hides a well." Small moments like this one (Nov. 4, Craters of the Moon National Park, Idaho) give Where I Stay its authentic voice. The narrator repeatedly finds the last shred of humanity in the modern wasteland. If Chris McCandless, the ill-fated true-life wanderer Jon Krakauer wrote about in Into The Wild, had met up with shadier characters, and decided that instead of searching for a way to live true to oneself realized that no matter how one lived it was true to them, Where I Stay could be a smarter companion to his adventures. 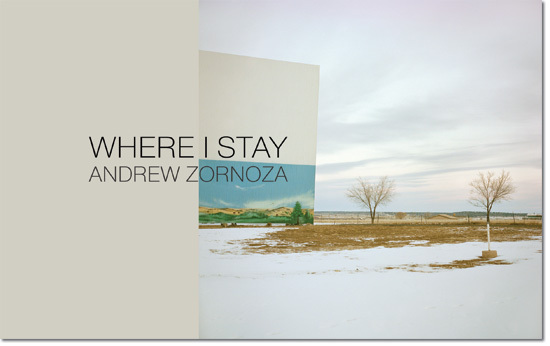 "Tarpaulin Sky Press has just published a new work of fiction by Andrew Zornoza, Where I Stay, which includes numerous embedded photographs. Unlike W.G. Sebald and most other writers that have scattered images in a sporadic manner throughout their texts, Zornoza’s book places a snapshot on every right hand page, setting up a visual rhythm with two sets of text. The left-hand page is a diary entry, complete with date and place, while on almost all of the right-hand pages, in addition to the photograph, there is an italicized text that is usually briefer than the diary entry. Part of the puzzling pleasure of reading Zornoza’s novel comes in attempting to triangulate these three components. The book opens with a 1938 quote from photographer Walker Evans (1903-1975), perhaps most famous for his Farm Security Administration photographs of the American Depression and for his collaboration with writer James Agee on the book Let Us Now Praise Famous Men (1941). These anonymous people who come and go in the cities and who move on the land; it is on what they look like, now; what is in their faces and in the windows and the streets beside them and around them; what they are wearing and what they are riding in, and how they are gesturing, that we need to concentrate consciously, with the camera. In spite of its title, Where I Stay is a restless book that moves all across the American West and even into Mexico. Time flows from August 2 to November 25, but otherwise there is no discernible progression. The narrator drifts, struggles, observes, and writes regular diary entries about day jobs, drugs and alcohol, death, loneliness, and brief attempts at friendship. Compared to the diary entries, the italicized texts on the right hand page are generally more meditative and reflective. Sometimes I wrote things down, fragments. But then I looked at them and they did not seem real and there seemed to be no purpose in writing them. There was nothing in them, other than things I did not want to remember. 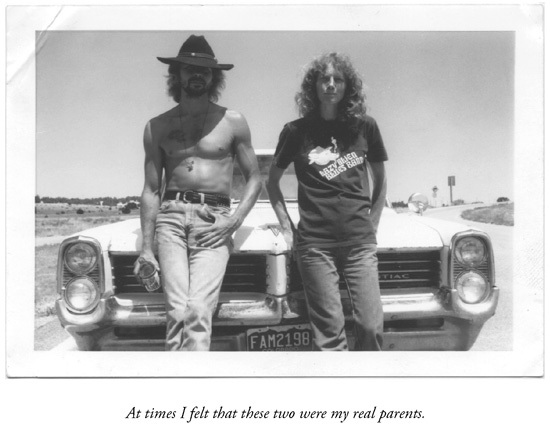 "This is an cryptic collection of random thoughts, experiences, and photographs of the author's fictional journey through the Western US and Mexico. This definitely isn't the scenic route: Zornoza's travels take him to the edge of urban life, mainly concentrating on the rough roads and deserted highways that have been left in the past by time and progress. The landscape is grey, gritty, and jagged: much like the words he chooses to describe his interactions and his reactions to it all. "A couple of years back, Blueberry Nights, a film by Wong Kar-wai was released and it sucked. Kar-wai is known for his dreamy, gauzy, sensual films, which obsess over love, lost, place, identity and time-- all delivered in fragmented narratives. Blueberry Nights was his first Hollywood film so what better to make than a “road movie?” The movie not only lacked vision and contained some awful acting, it really showcased how the obsession with the road has become another cliché of Americana. If I think of the road as a literary trope I think Steinbeck, Kerouac, and McCarthy. So my question was whether Zornoza and Peet’s books could make the road feel fresh again. These are two drastically different texts yet both are united in the necessity of search and that ability to be in a place, or of a place, to pass through a place, but not possess or change the place—i.e. the anti-capitalist imperative, that is if Huck Finn sets off down the river to find a freer and wilder America does it exist? According to Zornoza and Peet the answer is yes and no.